Karen Washington smiles in The Garden of Happiness in the Bronx. 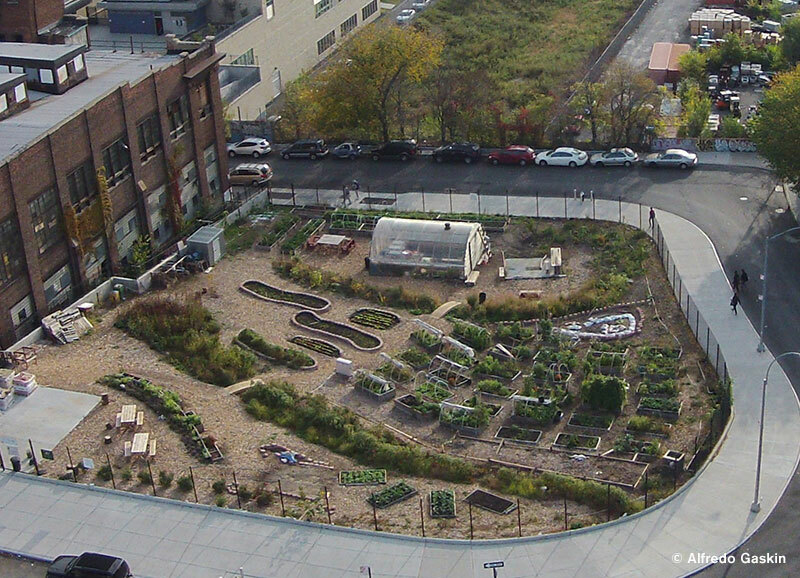 Over the years, some were turned into community gardens, primarily in an effort to beautify and reclaim neighborhoods devastated by New York’s fiscal crisis of the 1970s. Over time, the dedicated volunteers who created these urban oases realized they could provide so much more than simple beauty. Community gardens became centers for community organization, expressions of cultural identity, and sources of fresh fruit and vegetables for a population in dire need of healthy food. 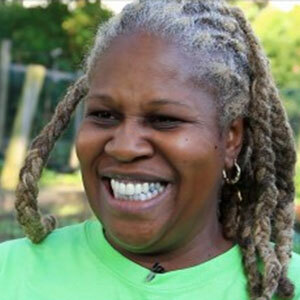 Washington recently sat down with us to tell us about her experiences working to keep urban gardening alive and well in the Bronx, a mission she’s been on since 1985. A NYBG Board member and founding member of NYBG’s Bronx Green-Up program, Washington has helped dozens of neighborhoods build their own community gardens. She joins a panel of other urban agriculture experts in our Growing the Urban Farm Symposium on November 18. She hopes that the symposium will foster interaction among key players of the urban agriculture movement and help discover how to get people, including government agencies like the Department of Agriculture, to take urban farmers more seriously. The reason for that, she says, is the key roles she’s seen urban gardens play in the community for the past 30 years. Her own Bronx community garden, The Garden of Happiness, plays host to a farmers’ market, where five rural farmers and four community gardens sell fresh produce to local families, never turning away anyone in need. Community gardens are safe havens for children and seniors, Washington says. It’s also a way for seniors to pass down their wisdom to new generations of gardeners. These are the same young gardeners who, over the past decade, have learned that food doesn’t come from a grocery store; it comes from the earth. And then there’s the alarming disparity between the food poverty in this country and the amount of food Americans throw away every year. It’s a rightfully sensitive subject. Washington has watched the Bronx grow and change over the decades, and has seen the right to maintain community gardens become a hotly contested political issue. Much work must be done to preserve these community gardens for future generations, and Washington is ready to protect the precious gardens and farms that have become so critical to the daily lives of Bronx residents, but also have piqued the interest of land developers. After World War II, people began moving out of cities, seeking refuge in the beauty and open spaces of the suburbs. In fact, just 15 years ago, it is estimated that half the population of the United States lived in suburban areas, according to the U.S. Census Bureau. Now, that trend is reversing, and as a result, community gardens are in an even more precarious situation as land in cities becomes more valuable. Every four years when garden leases are up for renewal, activists like Washington must be vigilant to ensure green spaces remain. Keeping elected officials aware of the value of community gardens and urban farms is of utmost importance, Washington says. She often invites senators, councilpersons, and other policy makers to visit gardens so they can see for themselves how vibrant, beautiful, and essential they are to the lives of New Yorkers. “Without a doubt, urban agriculture, especially in municipalities, is definitely tied to politics,” she said. 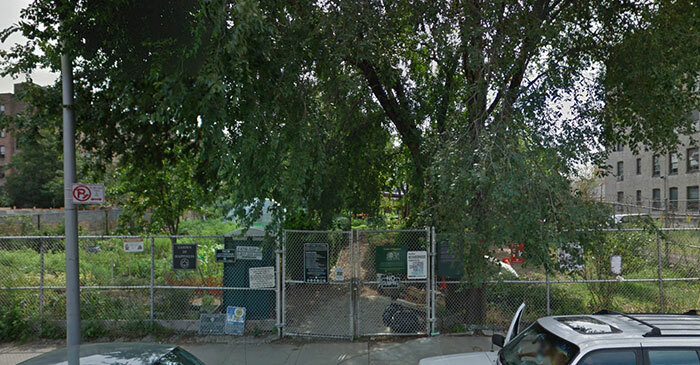 This month, Washington is a candidate for a $10,000 grant to fortify urban agriculture in the Bronx. The NationSwell All-Star Grant is awarded to the applicant who receives the most votes from the public. Ballots are open now through October 31. City residents, Washington insists, need community gardens, not just as places to congregate and talk, but for health and nutrition, too, because food is the common denominator among all people. Karen Washington, urban agriculture advocate, is a panelist for the Growing the Urban Farm Symposium at The New York Botanical Garden on Wednesday, November 18. Washington is joined by Mchezaji “Che” Axum, Nevin Cohen, and Annie Novak during the two-hour discussion, starting at 6 p.m. Learn more and register online.